These musicians really make the sparks fly! The drummers of the Dutch percussion group Slagerij van Kampen (literally Van Kampen's Butcher's Shop) are renowned worldwide for their musical fireworks. The five-piece percussion band is about to celebrate its 32nd anniversary. In those thirty-two years of drumming and with 14 different drummers over the years Slagerij van Kampen has blown itself to the top of the musical rock firmament. With just those remarkable drums an acoustic guitar, bass guitar and keyboard, it has become one of the first percussion bands to launch its own style. 'Danceable, catchy music with ethnic influences', that is how the musical encyclopedia officially describes the 'rocky' music of Slagerij van Kampen. However, the brainchild of composers Willem van Kruijsdijk and his partner, drummer Mies Wilbrink, the artistic leaders, who founded the group in 1982, is more than that. The group, plays both modern world percussion and music which is based on ethnic, traditional music of Central Africa. A sound that can best be described as instrumental rock music based on primal rhythms. Each time they perform a drum show bubbling with life, fireworks and energy, in which the latest electronic devices are interwoven with primitive, African beats. Light effects, sound spectacles, acrobatic swinging, hand and stick-drumming, and even luminous drums. The energy literally flies through the air from the stage to the hall, where the public seems to be pounding on imaginary drums as well. The fire is stoked, and the whole show becomes a total release of emotions. One moment drumsticks are swinging graciously through the air, and then, a moment later, skimming over or banging on the drums. It's full speed rock, that makes the audience howl as one in a sea of swelling sound. The percussionists of Slagerij van Kampen, Clara de Mik, Gijsbert Zwart, Boudine van Slobbe, Johan Boere and multi-instrumentalist Robin van Vliet, are swaying rhythmically back and forth behind their instruments like musical beasts. A natural fusion of music and musicians. Obviously Willem van Kruijsdijk and his partner Mies Wilbrink were very insightful and able to look ahead. They believed that music played by a group of synchronous drummers, only accompanied by a guitar, and every now and then a singer, could be something special and of high quality and they were proved right with the group delivering a huge amount of success. Although, since 2001 both no longer perform on stage, they are still very close to the group as artistic director and coaches. And together they still compose pieces for the band from their home in southern Spain. Their first performance in 1982, with Dree van Beeck and Marian Meijer, was for an audience of 300 people at the College of Social Studies in Eindhoven (the Netherlands) and was a huge success. 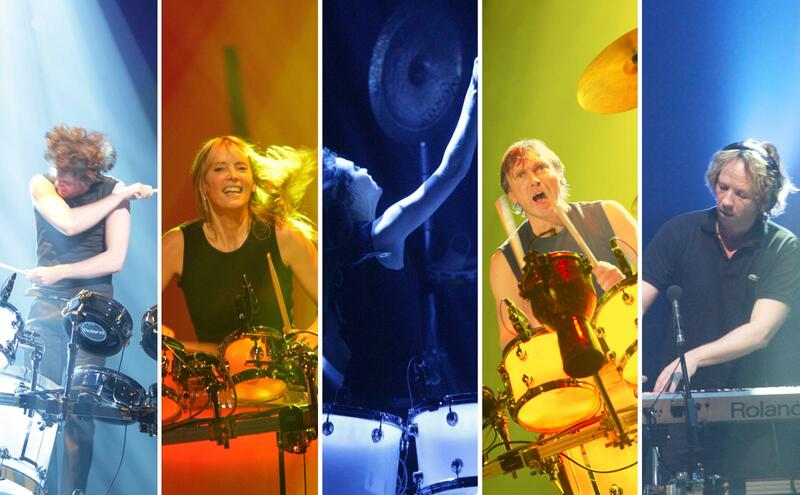 Since then, a large number of albums, CDs and DVDs have marked the long route that Willem and Mies and a great deal of their fellow drummers have followed in the last 32 years. On the albums made during their initial phase, the band plays mostly traditional-based drumming and percussion, while the later albums are full of the latest modern, electronic devices. The first two albums 'Slagerij van Kampen' (1986) and 'Out of the Doldrums' (1987) were release on old-fashioned vinyl records. Slagerij van Kampen was the first group that made a fully electronically drummed record entitled 'Out of the Doldrums'. Subsequently in 1989, 7 years afer the group was formed, they broke through with their first CD 'A Long Walk on a Short Pier', an impressive album crammed full of acoustic power and electronic fireworks. This was partly thanks to top producer Robert Musso, who had been working with Miles Davis, the Ramones and Mick Jagger (to name a few). In 1992, the album 'Tan' was recorded and in 1993 came the CD 'Link', also produced with Robert Musso and that stayed in the top 100 for the next three months. Also in 1993, the band were invited to take part in a televised concert, performing for Nelson Mandela, which they saw as the pinnacle of their career. Co-founder Willem van Kruijsdijk: "That was a huge success. It was when Nelson Mandela had just come out of prison and it was fantastic to perform for him. Mandela looked quite amused and found it very special that white men were drumming for a black man. He saw it as an appreciation of his culture and for him personally as a black human being." In 1994 the CD 'Spirit in The Storm' was released, a piece of music which represented clear artistic progress for the group with different styles and including unmistakably ethnical effects. 1996 was the year in which 'Live!' was produced, an album for which Slagerij van Kampen received a Golden Record (50,000 copies sold). The cast of the band was enlarged in 1997 when Robin van Vliet, (acoustic guitar, bass guitar, keyboard and percussion) joined. Also in 1997, Sony released the studio album 'Door', followed by the album 'Add Up To The Actual Size' (1999), for which Slagerij van Kampen received the Edison Music Award in the instrumental category. Then, in 2001, a double CD was released, entitled 'The road less travelled', to celebrate their 20th anniversary. Their career since then has seen a mixture of successes and failures. 2001 would become the year of sold-out halls, but by the end of March bad luck struck Willem's partner Mies Wilbrink, who had been until then a fanatic percussionist. Mies was being seriously affected by chronic arthritis of the neck and shoulders. This has forced Mies to realize that the time had come to end her drumming career and to take the reluctant decision to stop performing. The tour, which was running at that moment, had to be cancelled. A replacement for Mies was sought, and found in the person of Bente Olie. Now that his partner Mies could no longer perform, Willem van Kruijsdijk also decided to take a step back. For him, Slagerij van Kampen was also partly Mies. Willem and Mies were inseparable, and partners both in love and music. Without Mies, Slagerij van Kampen was not the same and then Gijsbert Zwart prepared himself to replace Willem and eventually took his place as a drummer. In October 2001, an extensive tour was planned to celebrate the 20th anniversary of the group. In 2003, after the fully booked Blow Tour, the decisive blow occurred when Willem van Kruijsdijk left the band. Nevertheless, he and Mies stayed in the band, but from now on as composers, and coaches, in the background. Then, after that turbulent period the DVD/CD project 'Differbag - 25 years of different drums' was released in 2004. This included a recording of the Energantica concert and extra interviews with the founders of the band talking about the background and the history of the group. In 2005, Slagerij van Kampen was honoured to be asked to perform for Queen Beatrix of the Netherlands during the celebrations for her Silver Jubilee. In the following years (2007/2008), Slagerij van Kampen organized an extensive jubilee tour celebrating their own 25th anniversary. And in 2012, they launched a series of highly succesful theatre performances 'MUCHOmenos', 'Evenintime' and 'Sticks 'N Drums 'N Let it Roll'. In their last tour, the band went back to what can be called the essence of their music: pure drumming, as loud as it can get. One fascinating aspect of this period was that the group started to use luminous drums that lit up as soon as they were struck, producing magnificent visual effects. Slagerij van Kampen, one of the first drum and percussion bands, soon became a unique phenomenon in the world of rock music. Success breeds success. Each year some 40 to 50,000 music fans visited the theatres and festivals where the group performed. The band, which is currently the ambassador for the Rhythm for Revival Foundation, always had one goal in mind: the drums, with their ethnic influences and effects, were to play the main role. The group sensed the sweet smell of success and developed into one of the most powerful drum bands in the world. It has spent years of thought, effort and sweat working on its own unique style, where the lighting and audio accompaniment play a big role. Manager Eric Dieteren (ICON Entertainment) explains: "Slagerij van Kampen has its own absolute style. The band performs in a way which makes something special happen with the audience. Something that cannot be labeled: it is not rock, not jazz, not pop, not reggae. It is Slagerij van Kampen." The spiritual father of the band, Willem van Kruijsdijk, is the man behind the sound that has made Slagerij van Kampen so successful. He makes a relaxed impression when he tells about how he got in touch with the pure, instinctive feeling of the African drum. Willem: "It's been a long time since I first saw Burundi players drumming. I must have been about 12, so it is more than 50 years ago. A missionary from Africa showed me a movie with drummers from countries like Burundi and Rwanda. It had very bad sound quality, but I could see African people drumming simultaneously in a group. That was a fantastic experience and it made a strong, indelible impression on me. And for years, even while drumming in different bands, that has always been in the back of my mind. As I am quite a creative drummer, there came a point when I wanted to start a percussion band. And in the course of developing that plan, I always had to think back to thios unique way of drumming, because in most African countries youj don't see this, only in Central Africa. This way of drumming, the way of synchronously drumming together 'en groupe', is very special and has an enormous and instinctive primal rhythm which I find very inspiring. Later I played quite some time with native people from Guinee and Senegal, which developed my love for African music even more. I find it also true that Slagerij van Kampen, with its beautiful and strong rocking music, also helps people escape from their daily lives and worries." Willem: "The powerful sound is obviously something that appeals to everybody and brings forward this primordial feeling for rhythm. Apart from the voice, the drums are the most ancient instruments of all times. When I was 12, I started to listen consciously to this kind of music. It was the time of the Beatles and the Stones. An era in which rock and pop culture started to flourish. When the Beatles appeared on the musical scene, I was 14, and obviously at that age you are very receptive for musical revolutions. The Stones in particular went for a kind of 'New orleans feeling' of music, which has also certain kinds of black influences. When I was a little boy, I already had a feeling for drumming and one day I saw a drum band playing for a boy who was celebrating his birthday. The sound was so overwhelming and thundering that I simply freaked out! It impressed me so much that, from that moment on, I start banging and hammering on everything whether it was nailed down or not. I drummed on pots and pans and all kinds of objects. The deafening noise of that drum band went into my soul and I found a kind of fever, an urge to drum that has never left me." In the end, it was definitely no impulse, because Willem van Kruijsdijk would eventually keep on drumming all his life. Although 'The Godfather' of Slagerij van Kampen no longer actively joins his colleagues behind the drums on stage, he still performs in the south of Spain, where he lives together with Mies, and where they regularly compose new music voor Slagerij van Kampen. Meanwhile he still performs in jazz ensembles and percussion bands. Willem is happy he can still that because, after all, drumming is his life. 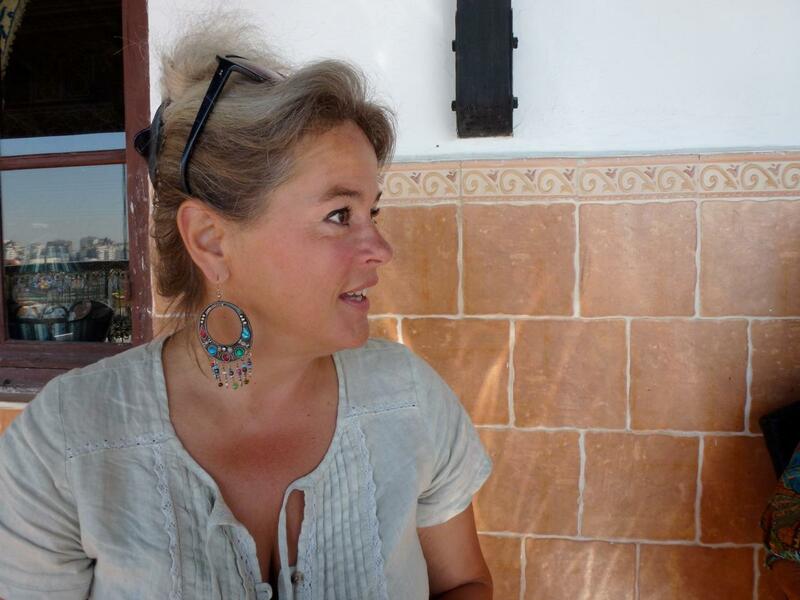 Willem: "Here in Spain you can see all kinds of musicians performing almost daily, especially people from Senegal, who live here and play the djembe." Mies Wilbrink: Drumming and performing "like a tigress"
Willem van Kruijsdijk met Mies Wilbrink (photo right) at the College of Social Studies in Eindhoven (the Netherlands) where he was a video instructor. One day she saw Willem drumming on some oil drums and she was so impressed that she immediately want to learn to do it herself. Willem let her have a go and also taught her his personal style of drumming, standing bedhind a drum, and making use of ethnic influences. Mies proved to have a strong musical instinct and gradually developed into a full professional drummer. According to Willem, she was performing very wild on stage, moving like a tigress, sweeping with her hair and swaying with her arms. In 1982, they founded Sagerij van Kampen together. Willem recognized Mies' talent immediately. With passion he says: "Mies is very musical, she studied the piano for a long time. She is also a psychologist and so she knows how to coach and approach the band members very well. She is very insightful. I taught her to drum in my style, which is somewhere between drumming and percussion. Of course, I could easily sit down behind the drums and play in a traditional way, but I found it more spectacular to perform very expressively and to drum in a standing position. It was a kind of primal, instinctive drumming that I performed producing an overwhelming sound." The drummers of Slagerij van Kampen don't just stand in front of their drums, they dance and swing and sway with their sticks. Willem explains: "We have been talking a lot about this, we wanted to make the movements as big and as beautiful as possible. And then some drums you play with your hand like the conga or the djembe." "I also think that the language, the way in which we express ourselves, is very important. That has always been based on the way the Burundi players used to do it. It is also the way you approach the rhythm. There are often open rhythms, to which you add your accents. 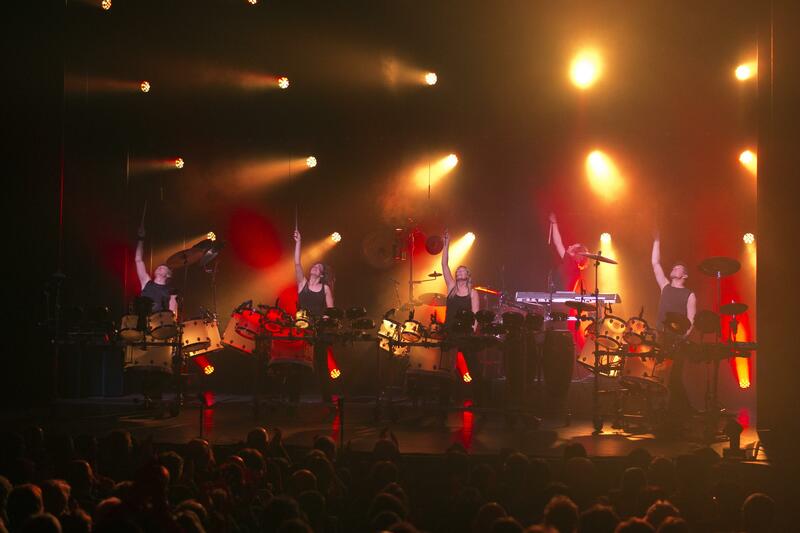 Most percussion bands that we see are rather eclectic, that means that they are playing in a style often based on virtuosity and other elements, but that is something people only like for a short while, or are even temporarily impressed by, but soon start finding it boring. We actually form a kind of rock group with synchronic drummers. In our way of composing, we have the idea that we have to make a song that people want to listen to; we make a kind of instinctive music accessible to everybody. Some three years ago, we also introduced luminojus drums, an idea of our manager Eric Dieteren. 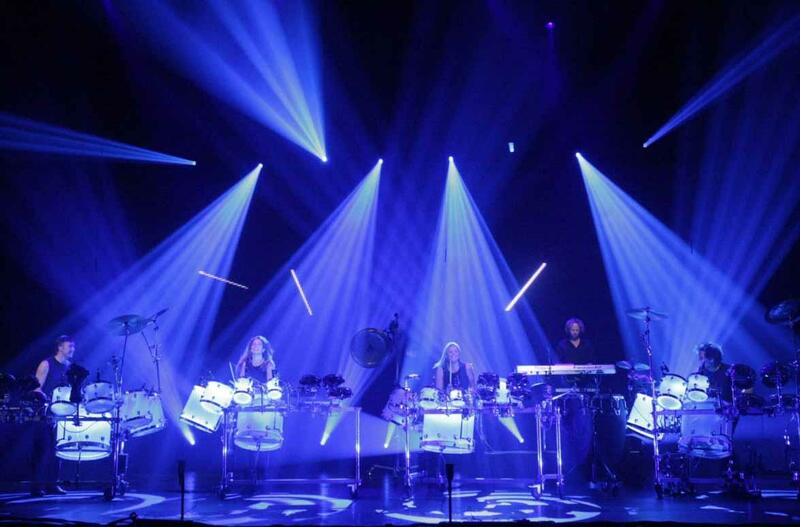 We were the first to introduce the spectacular light effects that occur when the drummers beat the drums. That gives a fantastic effect." Unfortunately, in 2001, Mikes Wilbrink had to stop performing because of arthritis, caused mainly by her impressive way of performing with her swirling arms and head banging. After a concert, she was wracked with pain. Willem: "Mies was becoming more and more important by my side. Over the years, she had developed into someone who could compose very well and also drum in a spectacular way. I have to admit though that the way in which we are drumming is very demanding on your body. And Mies was very fanatic. She moved, danced and stood there swinging like a tigress on stage. For years, we've been leading the band, but since 2001 I've also stopped performing. We see ourselves still as members of the group and are now mainly active as composers and act as coaches and artistic leaders of the group."